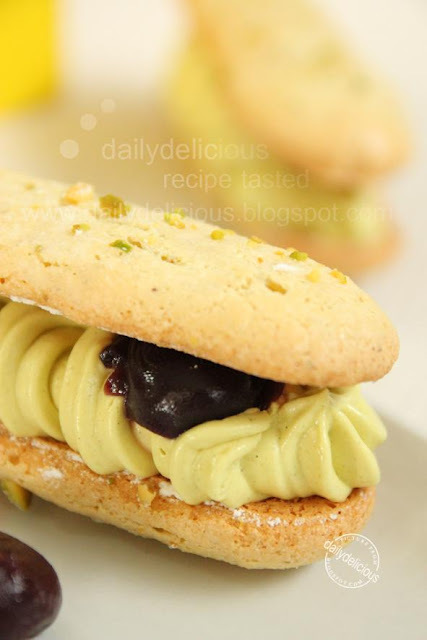 dailydelicious: Pistachio Dacquoise: One great dessert from one of great books! 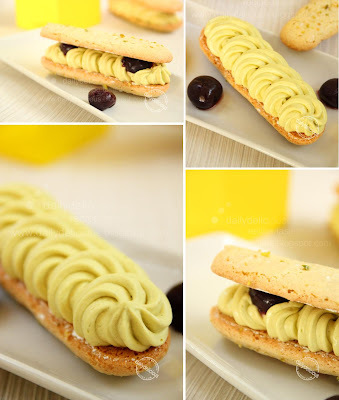 Pistachio Dacquoise: One great dessert from one of great books! I got this question from many people, they can't read Japanese but adore the cuteness of Japanese style pastry, "Are there any book on Japanese baking in English?" and I always said "No". Finally I found it, the baking book from Japan with English language ^^, and it's a shame that I saw it before but never paid attention to it. The book name is" ............................" or "........................" by 杉野英実 (Hidemi Sigino). As the name of the book can tell, this book is about the dessert (you can see inside of the book on my facebook's page, ..........). I remember that the first time that I saw this book is about 6 to 7 years ago, and my baking skill and knowledge is very low (I read the book and I didn't understand anything, ^^"). And I forgot about it and the fact that it's English translation, haha. After I heard about Hidemi Sigino once again from Swee San Lim, she asked me whether I have the book from him or not, and I realized that I still didn't buy the book from one of the most acclaimed Japanese pastry chef, (He won the 1991 World Baking Competition). You can guess about my reaction, hehe, I ordered 2 of his books as soon as possible. I'm so glad that I have them (and Thank again Swee San Lim for your suggestion ^^). Both of them are great, another book that I bought is " .......................(will talk about it later). But if you want to know about the recipe in any books, you will have to follow the recipe and see the result, haha, so it's my job to try and taste it. I chose "Pistachio Dacquoise", a small almond and pistachio cake with pistachio-butter filling. 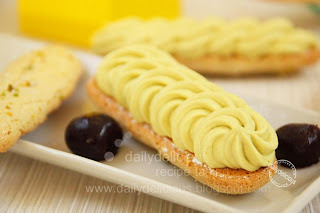 And the result is "Great", I was impressed by the deliciousness and softness of the filling, and the contrast between the dacquoise and the filling. Plus, nothing in this recipe is hard to do. Try serving these with a cup of tea, and you will agree with me that "........................" is one of the best book, that you should have. Ps. The filling is very soft, keep the filled dacquoise in the refrigerator if the weather is warm. Line 1 baking pan with baking paper. Whisk egg whites and granulated sugar until stiff peaks form. 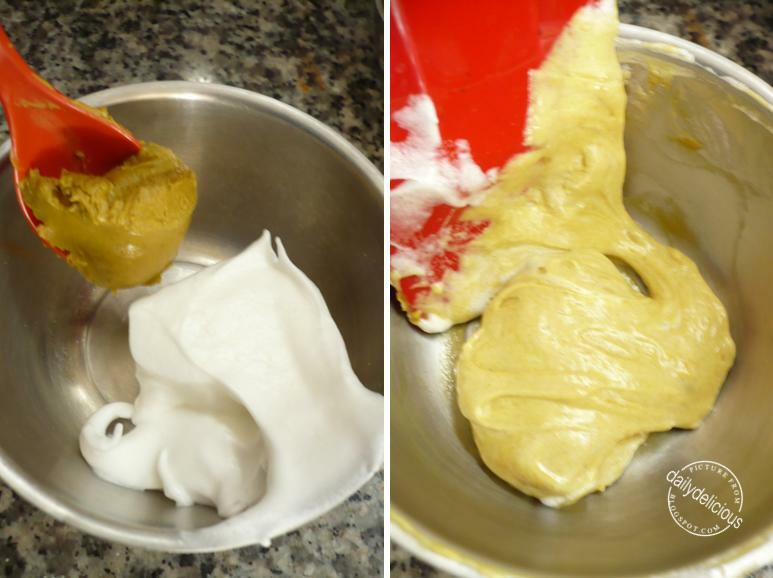 Mix pistachio paste with 1/4 cup of meringue until fully combine. Grind the pistachio, almond powder, and confectioners'sugar together until powdery, sift the mixture over the meringue with the pistachio paste mixture. Fold until combine (gently ^^). Put the batter into the piping bag with 15-mm round tip. Pipe fourteen 11-12 cm long dacquoises onto the prepared baking sheet. Sprinkle with confectioners' sugar and bake for 18-20minutes. 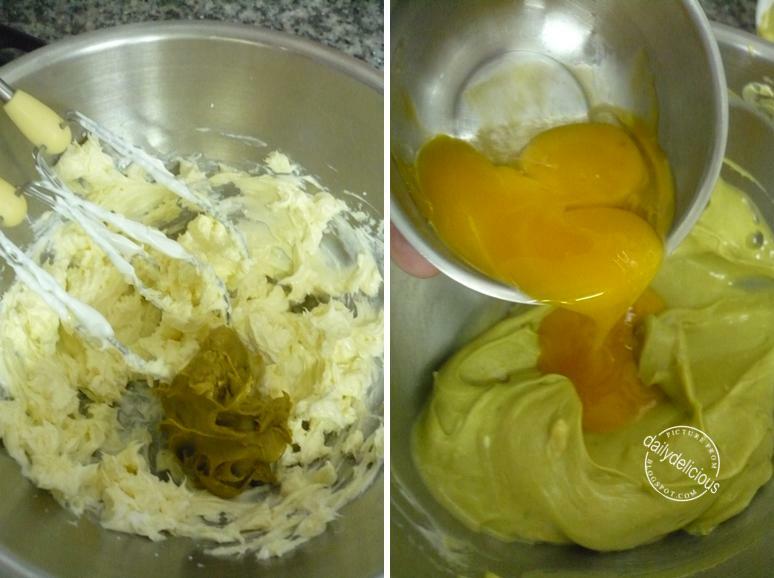 Cream the butter, add the pistachio paste, beat until combine, then follow with the egg yolks. Fold the Italian meringue into the butter mixture until combine. 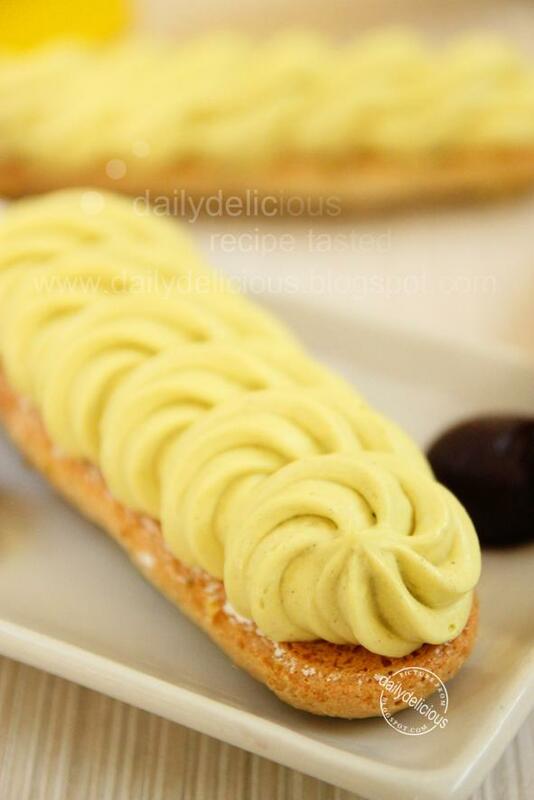 Pour the Pistachio-butter into the piping bag with star-shaped tip. Pipe the filling onto the flat side of half cakes, arrange cherries on top, and sandwich with remaining cakes. Hi I'm one of your fan I really enjoy your bakes. You are good, keep up thumbs for u !! 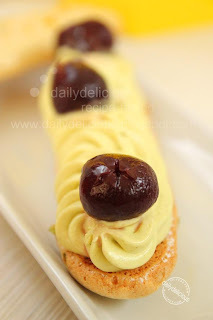 Omg, cant take my eyes from ur clicks, super delectable and pretty much addictive dessert..
Hi,You can use the same method as making Almond paste to make it "http://dailydelicious.blogspot.com/2011/02/home-made-almond-paste.html"
I always wish everyday to be sampling your blog posts! Look like everybody love him ^^. I will try his recipe and share it with you !!! The one that you talked about is originally in English ^^, will show you the book on my page. Oh, I wish I have a chance cook and bake for you all. Yes, ^^ I will share more recipe. Can I ask where did you get the book? It is so very difficult to find translated books even online. This one I ordered from Amazon Japan, you can buy it directly from there. May I know what's the title of the book? It's dessert book by Hidemi Sugino.